Sticky rice is another name for glutinous rice, a type of grain found in many Thai, Chinese and Japanese dishes. As the website Thai Food and Travel explains, sticky rice is also known as kao niow and is a starchy grain that is cultivated across Asia. Sticky rice clumps, and is thus easy to eat by hand and aids in sopping up sauce. Sticky rice differs from rice that you may be used to, so be sure to check the nutrition facts if you plan on consuming it often. According to the nutrition information from online food database DietFacts.com, 1 cup, or 200 grams, of sticky rice contains 169 calories. If you follow the daily recommended calorie intake of 2,000 per day, then 1 cup of sticky rice provides more than 8 percent of your daily calories. Exercise and other daily activities can increase your calorie needs. The Mayo Clinic notes that one hour of walking at two miles per hour burns 183 calories, more than the amount 1 cup of sticky rice contains. Like many grains, sticky rice is low in fat, according to DietFacts.com. The website notes that sticky rice contains just 0.33 grams of fat per cup. Although fat is high in calories and sometimes suggested to be a driving force in obesity, it is an essential nutrient. The National Library of Medicine and National Institutes of Health explain that dietary fat promotes proper growth and helps your body absorb vitamins. According to DietFacts.com, sticky rice contains 3.5 grams of protein per 1-cup serving. The website explains that this is about 8 percent of the 46 grams of protein women need each day. Protein is an essential nutrient because it is involved in the structure of your skin, muscles and other bodily tissues. The main source of calories in sticky rice is carbohydrates. DietFacts.com points out that nearly 88 percent of the calories in sticky rice come from carbohydrates. Each cup of sticky rice provides 37 grams of carbohydrates, with 1.7 grams of fiber. That's about 7 percent of the 25 grams of fiber women under age 50 need each day and 8 percent of the 21 grams women over age 50 require. The Mayo Clinic explains thatnfiber has a number of benefits, including regulating blood pressure and blood sugar levels. 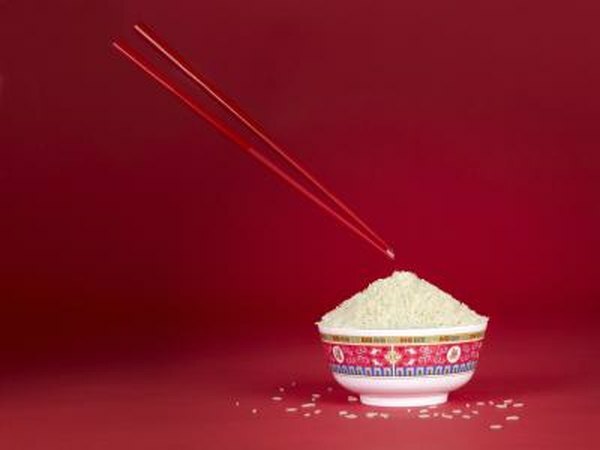 According to DietFacts.com, sticky rice is not a rich source of many nutrients, with the exception of selenium and the aforementioned fiber. Because of this, you should vary your diet so that it includes vitamins and minerals.